There is something in the air and soon enough everyone knows, as the leaves "race away" on the wind, that "Winter's coming. Won't be long." Then the first snow falls. What does the Mouseling think when he feels that "strange, cold tickle/between his slender toes" for the first time. Other mice are used to the wonder's of snow and are adept is getting about. Wherever they go they leave little "stitch and sew" marks in their wake. People are not so delicate. They "go stomping out" eager to play in the wonderful white stuff, their breath making "smoke/like an engine puffing." Besides playing in the snow there are all the preparations to be made for Christmas. Though there are presents to be bought and gifts to wrap and cookies to make, more than anything there are those endless moments when we "wait and wait." And while we wait we can wonder about the animals. Do they have Christmas celebrations? 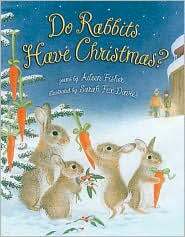 Do the rabbits have Christmas? Certainly they have lots of beautiful Christmas trees "with silvery handles" and "icicle candles." In this delightful collection of poems written by the late Aileen Fisher, readers get to enjoy winter and the Christmas season to the fullest, with image filled rhyming poems which transport the reader to a wintery world. To compliment the poems Sarah Fox-Davies has created wonderfully detailed illustrations which capture the beauty of snow covered landscapes, the animals that live in them, children playing, and cozy fireside and Christmassy scenes.